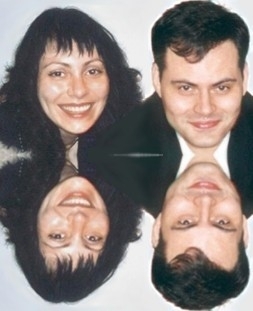 Upside-down World was created by Noga Friedman and Moti Friedman for their five children and for all the other children of the world. Noga is a writer and artist. She holds a PhD and M.Sc., both from the University of Leicester, and a BFA from Bezalel Academy of Arts & Design, including one year as an exchange student at the Ecole Nationale Supérieure Des Beaux-arts. Her works have been shown in numerous exhibitions, including at Les Artistes Français in Paris. Moti is also a writer and artist. He holds a PhD from the University of Leicester, a MSM from Boston University and Ben-Gurion University, and a B.Sc. from Tel-Aviv University. He has published illustrations in various journals and created works such as portraits that can be found in many countries, including the USA, the UK and France.